It has been a relaxing and cold new year so far. Freezing temperatures all week have killed my tomato plants but then having tomato plants survive all year long is abnormal anyway. 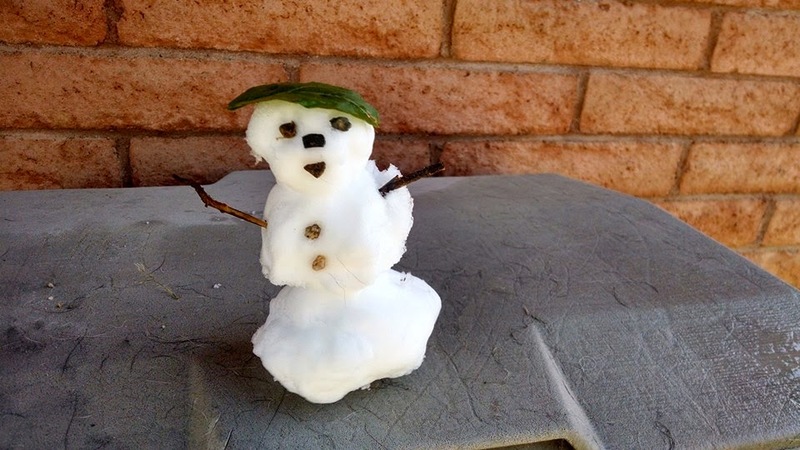 It snowed on New Year's Day and I made the obligatory snowman. The last time I made one was around 6 years ago. The snow was gone by noon except for some shady areas. My rain buckets keep freezing over every night which really confuses the dogs when they try to drink out of them in the morning. My motivation to go out to my property and clean was very low so I opted to stay in and do the usual laundry, cleaning, watching Cesar Milan and trying to train my dogs to walk properly behind me. I'm not a very good pack leader. I took them out individually and they did alright. As a group they are pretty unruly. Besides just taking it easy this long weekend, I did color my hair and do some more painting in the bathroom. I am the slowest painter in the world. I'm just dabbing at it with a brush instead of really attacking it with drop cloths and rollers. I have one more day left. Maybe I will suddenly get an urge to paint. I must say, the more I paint, the better it looks. You would think that would motivate me. It would feel great to cross that chore off my list. you have snow and I have sunshine. What is going on? I have the same apathy towards chores though. My endless cough/cold/virus/flu thing thing makes me enthusiastic about nothing except my settee! I have seen news items about snow in Arizona lately. We here in NY got zonked with a big blizzard to begin 2014 but all we had was a lot of rain so far this year. Temps will rise into the 50s today but then drop like a rock into this week, probably when your temps rise into the 50s and beyond. Talk about weather reversals. Hope you do better with your painting. Last time I did a big paint job (my apartment back in 12989 when I first moved in), I knocked over the paint can and made a big mess! I hope you feel better, Lizzie. If I was feeling ill I definitely wouldn't get off the couch. The dogs probably would have like that. Dave, the cold weather is coming your way. Today was a lovely 65 degrees and the rest of the week looks great too although I will be stuck in an office so it really doesn't matter.